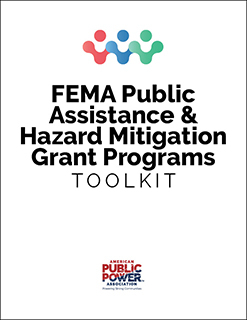 With the FEMA Assistance and Hazard Mitigation Grant Programs Toolkit, you’ll have a summary of the procurement law, policies, and regulations you need when working with FEMA on disaster assistance and funding. You’ll learn specific terms related to the grant process, get a list of do’s and don’ts, and learn from your public power colleagues through case studies. You’ll also receive a hard copy of the Procurement of Goods and Services Eligible for FEMA Reimbursement Quick Guide and a digital version of the Toolkit appendix with hyperlinked resources.